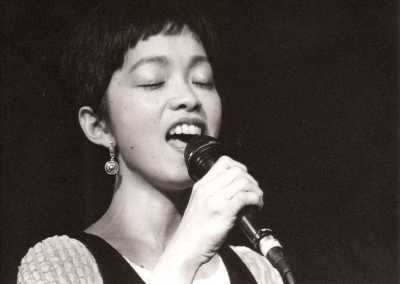 Peggy Chew is an Chinese American jazz singer who breathes new life in the vocal jazz tradition with her modern sounds and songs. Her repertoire of American jazz, folk, pop, Brazilian and Chinese songs reflect her multicultural background and interests. She sings in English, Chinese, Portuguese and also improvises wordlessly. Festival appearances: JZ Shanghai Music Festival, Culturescapes Festival, Leung Ping-Kwan Poetry Retrospective in Hong Kong, Cully Select Jazz Festival, Zürcher Seenacht Fäscht, Jazz Nights Aesch, Jecklin "Red Note" Jazz Festival and altriusoni Jazz Festival.